I have a lot of feelings about this, both of the excited and terrified varieties, because it means that the book will finally be done, donedoneDONE, but also that it’s too late to change anything about it, make it better, or otherwise obsess over it. It means that it’s no longer mine, in a sense. But on the upside, it soon will be yours! It also means that you should grab a pencil and get out your calendar, because I’m taking this show on the road. I’ll be traveling around, doing readings and signings – regrettably, not karaoke’ing Hole’s greatest hits – for a good chunk of May. Brandon has to stay home and make pizza, and June has to stay home and work on her pronunciation of pizza, so I hope you’ll come out and keep me company. I got to meet many of you when my first book came out, and it was, by far, the best part of the whole book thing. I’ve been hoping that I would get to go on tour again with this book, and I feel so, so, so very lucky that I do. Please come say hello! In the meantime, you can pre-order Delancey, if you feel sufficiently moved, at any number of places, like Apple iBookstore, Amazon, Barnes & Noble, University Book Store, Books-A-Million, Powell’s, or an independent bookstore in your area. Tickets are $10 and refreshments will be served. Tickets are $45 and include refreshments and a copy of DELANCEY. Reservations required. P.S. Make yourself a Black Manhattan tonight! I had one last weekend, with Amaro Nardini in place of Averna, and I’m still thinking about it. It would be soooooo easy to shoehorn in a stop in Austin between Oklahoma and Washington, DC. Just sayin'. Is this your full tour schedule? If you will be adding any more cities and dates please, please, please consider coming to Salt Lake City!! We have an amazing independent book store here, and also it's where I live and I am a huge fan of both your first book and your blog 🙂 Good luck and have fun and *fingers crossed* maybe I'll see you in SLC! I've pre-ordered your book & can't wait to receive it! And I'm so looking forward to your book tour – I plan to be at your Brooklyn stop! Of all the luck – I'll be in NYC when you are in Vancouver for your book tour. Rats! I DO get down to Seattle every few months so there's that. Bummer! We will be out of town all the days you are in our area! But I will buy the book, lots of copies of the book! Congratulations! oh if I wasn't across the pond… your book tour sounds like fun! Can't wait for the Portland event!! Hopefully all of our snow will be gone by May! Omg. Doll Parts is my next karaoke song. Brilliant! That picture of you is grand. Have a great time on your book tour! Looking forward to reading Delancey. Hopefully there's a part two of your tour and it takes you to the South, maybe even Florida! Looking forward to seeing you in Brooklyn! I'm thrilled that you are making your way to Minnesota! I read your first book about a year ago, and I've been reading your blog ever since. 'Looking forward to meeting you! Congratulations!!! Looks like I'll have to stop by the Ferry Building to say hello. I know you've got family in the area, but if you need a place to crash or someone to eat with, you let me know! I'd like to second the SLC vote! I often think it, but I don't say it enough: your comments make me so happy. Thank you! I can't wait to see you in May. And I would love to add more stops to the list, but really, it's up to my publisher and the bookstores. And, weeeeeell, my mother and my mother-in-law might revolt if I'm gone any longer. They're coming to Seattle to help take care of June in my absence. KatyBelle, I'm coming to Canada! But so far, only to Vancouver. So sorry! darn darn darn. I'm in Norway when you're in SF. i am not actually complaining, because I'm very excited about going to Norway, but it was disappointing nonetheless to see how the dates (didn't) mesh. I am very much looking forward to the book. Also, your previous book helped reconnect an old friend of mine and myself, so thank you for that. Enjoy this time. Excited for you. That June video is soo cute. oh oh oh there's a chance I could maybe swing down to DC! that would make me so happy! I'm SO excited for Delancey to be published! I wish I lived near one of your book tour stops, but alas, not everything is meant to be 🙂 Have a lovely tour. Woohoo you're coming to Minnesota. I've been reading your blog for a few years now and have “A Homemade Life”, which is thoroughly splattered with chocolate cake batter and cranberry chutney. And now I have the chance to meet you in person. come to the mitten state! michigan will greet you with such cheer! I'll be at the San Francisco event, if I can get away from my 3-year-old. Can't wait! Yay. My copy of Delancey is pre-ordered, and I can't wait to receive it! The Black Manhattan sounds fantastic. I got the Nardini Amaro based on your (Brandon's) recommendation and love it, but, believe it or not, Averna is the amaro I have always had hanging around. I'm going to give this drink a try both ways – and maybe even try it with Scotch! My most recent after-dinner drink has become B & B on the rocks. It is quite delicious. So sad you are not coming to Chicago, but I understand you can't come everywhere! I made a trip to visit friends in Yakima a few years ago, and flew into Seattle with the intention to visit Delancy and Essex. It just so happened to be the week June was born, so Delancy wasn't open, but we were able to have drinks and some tasty snacks at Essex. One of these days I will get to meet you in person and thank you for all of your wonderful stories and recipes. I don't know if it's because I was pregnant, and your book accompanied me to many dr visits, that I feel so close to your writing? I worked for Anthropologie at the time and we were selling your book and I picked it up one day on a whim. Loved it and can't wait for the next! Best wishes and safe travels! Over-the-moon excited about your stop in Santa Cruz! I consumed an advance copy of Delancey and LOVED IT. See you in May! This is such thrilling news, Molly! My day is always brighter when a new Orangette post arrives in my inbox, and how much happier will I be when your delicious new book arrives in my home! I hope to make it to your Brooklyn event, but until then, congrats in advance! Cannot tell you how exciting this is! Usually I drive to LA to see my favorite writers. I love that photo. At first I was all, Damn that's the best book tour image EVER. Looking forward to your SF visit. Don't worry — your book will be wonderful! Wow! Somehow you missed Missoula, Montana so I guess I won't get to see you. You should reconsider adding it to your tour. We're a friendly bunch. Love your writing and your blog. Sadly, I noticed Chicago wasn't on the list. We hope you visit the Windy City soon. Exciting! Just put your first Seattle date on my calendar. Looking forward to seeing and hearing you in person! Congratulations!!! Molly, I just saw that you'll be in Van! If you come to Alberta, I'm there in a heartbeat! How exciting…. See you in Pleasonton, CA!!!! No Village Books in Bellingham? Sniff, sniff! Yay! I am really looking forward to reading it. I hope to catch you at Book Larder! Congrats again, Molly. I am so very excited about your new book and wish you were making a stop in Missoula, MT! Have fun on your book tour! This is so exciting! But most of, this is to shout: please make it to the other side of the pond and come to London! Hey, Molly! I preordered 'Delancey Street' ages ago and am thrilled to see that you'll be just a few miles from me (in Wayzata, MN) in May. I will be there! I would definitely come out to see you if you came to Philly (but it looks like you're not), but I cannot wait to get my hands on a copy of Delancey! Yay! This former Ballardite will see you in Wellesley, MA! Live in Australia and really enjoy your blog. I am so pleased for you. We will be in NY for the first time in a few weeks and leave on May 14. Greenlight Bookstore has just made the list of things to do!! Once again I hurry to the grocery store after I read your blog. Same thing happens each time I re-read sections of your book. Thank you! Can't wait to see you in DC! Molly, I was fortunate to receive an advance copy of your book (thank you!) and wowzers, it's pretty freaking awesome. I haven't had a chance to try any of the recipes yet, but those dates are calling my name. Thanks for sharing your story with us – next time I'm in Seattle I'll for sure stop by for a slice. Love Full Circle in your hometown but will actually have to finally make a BookSmart event in Tulsa. Thanks for the advanced notice so I can get it in my calendar! Denver is lovely in May! You're not coming to Texas? Houston would love to meet you (me, too)! Can't wait to read your book. Already pre-ordered on Amazon. This is the second friend book tour that will not stop in L.A. Maybe nobody reads in L.A.? Sigh. Hooray! I'm planning to come to the Brooklyn event. Looking forward to it! 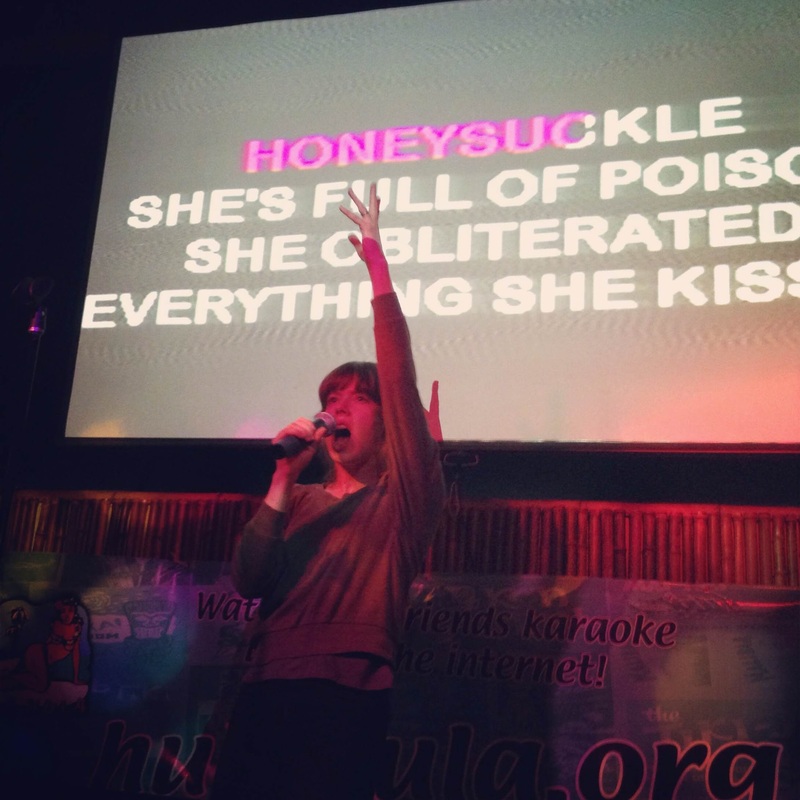 Come to New Orleans and we will take you to the best karaoke. Sad!! No Los Angeles?? Both Mission Viejo and Pleasanton are so far away! 🙁 How did LA get passed over? I hope it gets added on! I received an ARC of 'Delancey' from Amazon. Your book is superb. My family took me to Delancey when I was visiting Seattle, and I had the best pizza I have eaten. Now, I understand more fully, what you and Brandon went through to develop the best crust and the best pizza! how i wish you were doing a book reading in india, new delhi, tobe specific. i am right now reading your first book andl loving every bit of it. No Australia stops on this tour! Maybe next book? I preordered a couple of months back, looking forward to it. Wa-hoo! Congratulations. You express the butterflies and jitters and no-longer-mine vulnerability so beautifully. From one tour survivor to another, take good care of yourself on the road, get to bed early, and make sure your publicist triple-checks the stock at each store beforehand. Especially in MN. Listening to Hole transports me back to a time of teen angst and bad poetry (mine). I'll be in Mission Viejo while you are in Santa Cruz and vice versa. I am disappointed I will not have a chance to meet you. Enjoy Bookshop Santa Cruz. They are a wild bunch in the very best way. Yay! You are coming to Santa Cruz :o) Can't wait. Made your (or Brandon's) chana masala last night & it was very well received. Can't wait to have leftovers tonight. Now, to pre-order or buy from Bookshop SC? Really can't wait!! So excited about your new book. Loved the first book. Sadly I live in Atlanta, Ga. Not even close to your book tour. Congratulations, Molly! I met you here in DC at Ceiba on your first tour. So psyched to see you will be gracing Politics & Prose this time, although I cannot make it. Hi Molly! Can I make a pitch for Kansas City when you are in the OK area? Or – another Seattle date at the very end of May, when we will most certainly be dining at Delancey while on vacation? Unfortunately I learned my lesson with Politics & Prose when the Smitten Kitchen book tour came there. Even though the store is in a remote, hard-to-get-to part of town, the line snaked down the block and it looked like a claustrophobic nightmare inside! I'm sure you'll have a similar turnout. How exciting that you are coming to DC! If you find yourself with extra time on your hands earlier in the day on May 10, it is EU Embassy Day (http://www.euopenhouse.org/). I hope you enjoy your travels! Loved your first book and just pre-ordered the Delancey and am planning on being at the Brooklyn stop of the tour. Molly, Allison here. I used to live in Seattle and sit at the kitchen bar in Delancy and riff with your husband and the other cool people there and drink tasty, tasty drinks made with just a few perfect ingredients. Then I moved to my home, Missoula. Now am in SLC with my love. But I miss the scene in Seattle and Missoula too, believe it or not. I was happy to see all of the SLC votes, and understand with a sad heart that you can't add us. Just know you are so incredibly wonderful delightful and after catching up on some of your posts realize I need to make this a more frequent ritual. Thank you for your delightful writing, it makes me happy. Could you please, please come to Phoenix? We have wonderful independent bookstores and a great food culture. I have pre-ordered your book to download to my Kindle on the day its released. Another reason to wish that I lived in America! But I must be thankful that your new book is available from Amazon UK, in fact it has been sitting on my wish list since I first found out about it…..and I have a birthday in just 11 days time so have my fingers crossed. If I don't get given it, well, I will just have to buy it for myself. I really just screamed when I saw you are coming to Wellesley. I will be there and can't wait to say hello! I truly enjoy your blog–very well written and fascinating! Since you enjoy podcasts while traveling, I highly recommend the podcast “How to Do Everything.” The episodes are pretty short and entertaining. Safe travels on your tour!